You can create a customized color scheme, also known as theme colors, in PowerPoint and use it in other Office applications. Find a standard theme color that you like, and then modify and save it in PowerPoint. The next time that you create a new PowerPoint presentation, Word document, or Excel workbook, you can use the theme color that you created. On the Design tab, click the arrow under Variants, and point to Colors. Click a color box that you want to change. For example, Accent 1. Click a new color in the Colors dialog box. Repeat steps 3 and 4 for each color you want to change. Close the Colors dialog box. In the Name box, type a name for your custom theme color, and then click Save. The theme color is applied to the current presentation. On the Design tab, click the arrow under Variants, point to Colors, and then click the name of the theme color you created. 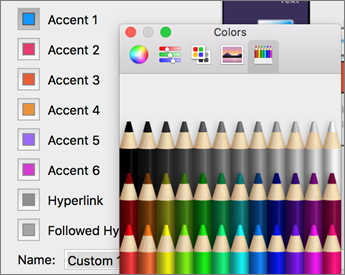 In the Mac OS X Finder, find your custom theme color in /Users/ Username/Library/Application Support/Microsoft/Office/User Templates/My Themes/Theme Colors. Drag the file with your custom theme color — for example, Custom 1.xml — to the Trash. Note: The deleted theme color remains in the Colors list on the Design tab until you quit and then reopen the Office applications. On the Themes tab, under Theme Options, click Colors, and then click Create Theme Colors. Click a color that you want to change, and then click Change Color. Click a color that you want, and then click OK.
Repeat steps 2 and 3 for each color that you want to change. In the Name box, type a name for your custom theme color, and then click Apply to All. On the Themes tab, under Theme Options, click Colors, and then click the theme color that you created. Note: The deleted theme color remains in the Colors list on the Themes tab until you quit and then reopen the Office applications.